A very impressive walking stick ideal for use on the smartest occasions. The Mayfair derby features an elegant and supportive derby handle in pink and white marbled acrylic, which is very smooth and pleasant to hold. It is fitted with a magnificent collar set with sparkling crystals, to ensure its user can make a glamorous style statement with their cane. 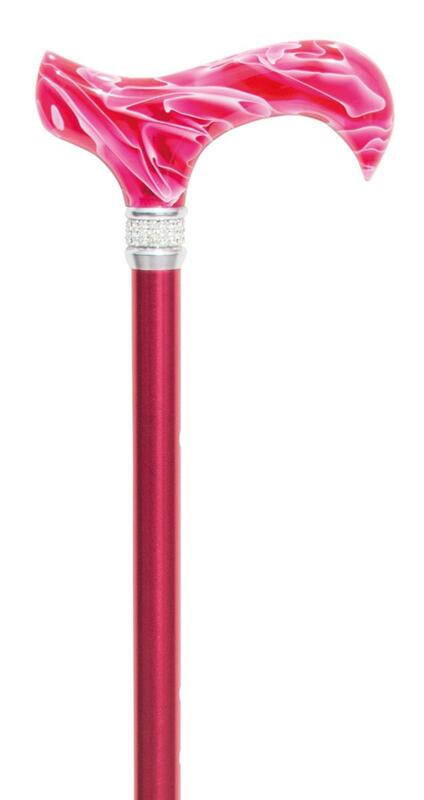 The deep pink aluminium shaft is adjustable so the overall height of the cane can be set between 70 and 92cm, making it suitable for a wide variety of users. It is fitted with a black non-slip rubber ferrule. Item weight 295g. Ferrule size 16mm.